Before we go into detail about this powerful remedy, we must first establish what dandruff actually is. Dandruff is a common affliction characterised by a flaky & itchy scalp that affects a staggeringly large percentage of the population. Our skin is constantly renewing itself. Sometimes this process happens at a faster pace than intended. The result is dead skin forming on the scalp that is easily loosened by our hair. It is these flakes that we refer to as dandruff. There are many popular methods of dealing with dandruff ranging from expensive tar based shampoos to more natural approaches including green tea or yoghurt, but a lot of these methods only treat the issue in the short term. Within a matter of days you could be back to square one. What is the most powerful natural anti-dandruff remedy? 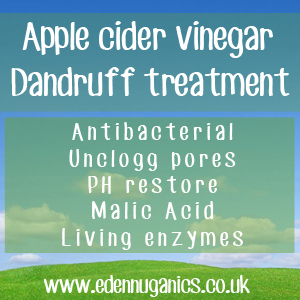 One of the most tried and tested natural remedies for the treatment of persistent dandruff is raw , organic apple cider vinegar. This powerful multi-talented health tonic has an endless list of applications and the treatment of dandruff is just one of them. ACV contains a substance known as Malic acid. This corrosive formula works in combination with powerful enzymes to help remove unwanted bacteria and yeast from the scalp. Cider vinegar also helps to restore hair's natural pH levels, making it much harder for yeast to take hold and produce the flakes associated with dandruff in the first place. How to treat your dandruff? When treating dandruff with ACV there is no definitive method that works best. Instead it's best to take different approaches depending on the severity of the case. Mild: When dealing with mild dandruff, a simple weekly ACV rinse with a 50-50 mixture of ACV and water will help to keep away those unwanted flakes and remove excess oil from the hair. Simply massage the mixture into your hair for around one minute making sure to work on the roots and scalp area. Shampoo as normal afterwards to remove any unwanted smells. Moderate: For people suffering from moderate or visible dandruff, a more drastic approach can be taken. This involves adding half a cup of apple cider vinegar to your daily shampoo routine, ideally combining the two in a mug before use. This treats the dandruff build up on a daily basis not allowing the yeast time to take hold on the scalp. Severe: When treating severe cases of dandruff, neat, undiluted ACV can be applied to the scalp and massaged in every other day for a week. This has a dramatic alkalising effect on hair's pH and should help the skin of the scalp return to its normal function. Here is a great video by C.Lux Cooper talking about how she uses ACV for dandruff and the positive results she has received from the remedy. ACV works as an anti-bacterial & fungicide. It helps to open pores that get clogged from cosmetics. ACV restores your hairs' natural acid-alkaline balance. Apple cider vinegar contains Acetic & Malic acid. The powerful enzymes found in ACV remove unwanted fungus. Tea tree - Tea tree oil is a powerful natural anti-fungal and antiseptic substance used as a major component in many commercial dandruff shampoos. By adding around 5 drops of tea tree oil to a cup of ACV before use, you can increase its effectiveness and leave your hair smelling great. Olive oil - Olive oil has been used as a dandruff treatment for decades. This age old folk remedy has lasted the test of time and with good reason. We recommend adding 10 drops of extra virgin olive oil to a cup of apple cider vinegar to leave your scalp flake free and hair feeling lush, soft and conditioned. Lemon Juice - Lemon juice is full of citric acid. In a similar way to the acids found in apple cider vinegar, citric acid has an anti-fungal action that helps to reduce yeast on our scalp. Combining lemon juice with ACV is a great way to increase its effectiveness at very little extra cost. When using apple cider vinegar for any health reason, it's very important to purchase the raw unfiltered variety. Many cheaper brands filter and pasteurize their vinegar, removing many, if not all, of the health benefits in the process.